I'm not a fab of New Year's resolutions. I've recently started choosing a word for the year but I've seen the '18 Goals for 2018' posts floating around, the idea of which has really appealed to me. Perhaps its just me, but resolutions seems to imply they should be set in stone whereas goals doesn't seem quite so.... rigid. 1) Read 12 books - I had aimed to read 1 book a month through 2017 and I managed 9, so it wasn't a complete fail. Again, I'm aiming for 12 and have some lined up. I signed myself up on Good Reads and plan to make full use of it. Read a great book? I'm open to suggestions! 2) Move more - Continuing to make use of fitness trackers (currently a Samsung Gear Fit, but I'm not convinced that'll be the only one I use this year as its already broken twice), I'm going to continue to aim for 70,000 steps a week which across the week is the recommended 10,000 a day. 3) Measure myself - following on from above. I want to start to measure myself on a monthly basis so that I can measure any weightloss regardless of what the scales show. 4) Be more creative - Whether its getting the paintbrushes out and painting some furniture, attempting to sew more or even just sitting down with the girls to do some colouring, its something I need to do more of as I enjoy it so much. It clears my head, stops me from picking in the evenings and helps me relax. 5) Clear out some of my handbags. At last count I think I had 35 which is a ridiculous amount when you consider I barely use any of them. 6) Clear out my shoes and knee high boots. Again, I have a fair few and I can't wear half of them anymore. 7) General declutter. There's just so. Much. Stuff. I've still got boxes that I haven't properly opened and gone through since moving (three years this May, yikes!) and enough is enough. A couple of weeks before Christmas I sorted through some them and took some things to the charity shop and put others aside to pop on eBay. 8) Meal planning and new recipes. Following on from what I was saying above, in an attempt to stop myself from grabbing whatever is to hand, I want to make more of an effort with meal planning. I've already planned and purchased for this weeks! I want to try more new recipes to stop us getting bored with mealtimes. 9) Writing more. I enjoy it. I want to record more and I want to improve on it. 10) More patience. Definitely a work in progress, lack of patience is something I really struggle with. 11) Increase my savings. I don't have a minimum target in mind, in all honesty anything would be a bonus as I've saved so little since we moved house almost 3 years ago. 12) Get organised. Time. Paperwork. House. Everything really. but I want to try and do it differently this year as last year some of the plants weren't in the best position. 15) Keep on top of the housework. Particularly cleaning the windows and the playroom. Both are jobs I hate doing. 16) Drink more water. I've always drank a lot of water but recently more coffee and diet coke has been creeping in. 17) Continue to improve my make up and skin care routine. I've started working on this and I'm already seeing benefits. 18) Finish the online course I started last year. It was only £15 through Groupon (I think) and so far I've not got very far with it. Thankfully its not on a time limit but I'd quite like to get it completed! I do enjoy learning, its just finding the time to do it! 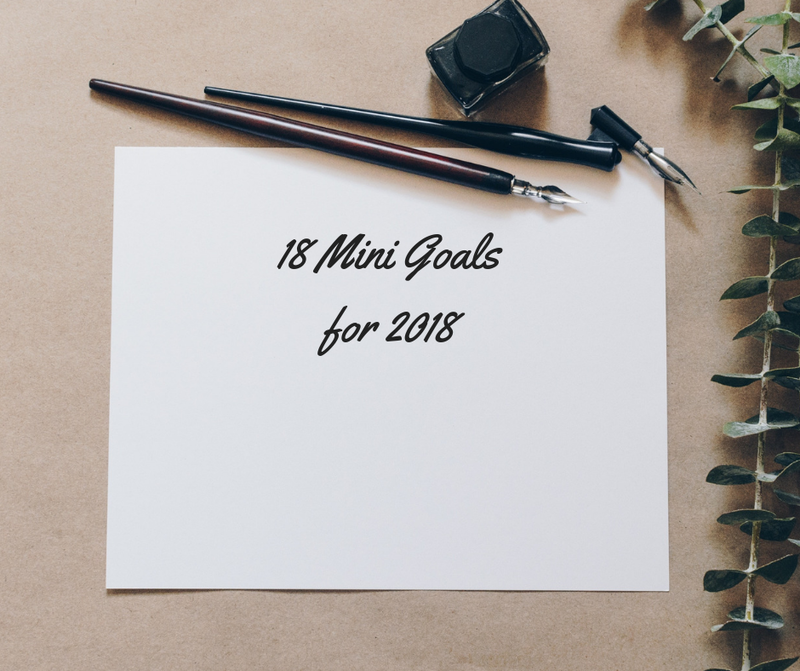 18 mini goals. I think these are achievable and I'm not putting too much pressure on myself... We shall see!